Ventura Aerospace has a legacy in aviation that can be traced back to the pioneering days of aviation. The vision that started us on this path continues to excite us today. Our innovative fire suppression systems are designed to deal with the cargo fires of today not just the regulations of yesterday. From a design concept to engineering, and then on to manufacturing, Ventura Aerospace has the experience, the vision and the expertise to make anything a reality. Our services are not finished when we deliver a product. Ventura Aerospace provides lifetime support to a growing number of customers. Every day hundreds of freighter aircraft safely take to the skies to deliver high yield cargo around the world. Ventura Aerospace provides a range of safety systems that ensure that those aircraft continue to do so, including our aircraft fire suppression systems. Our highly-engineered safety systems provide peace of mind to flight crews and operators worldwide. Our legacy in aviation, our commitment to safety, and our dedication to our customers is present in everything we do. We have grown from our roots in providing rigid cargo barriers into a mature and diverse company that offers the aerospace industry safety solutions to the every-changing global landscape of air freight. 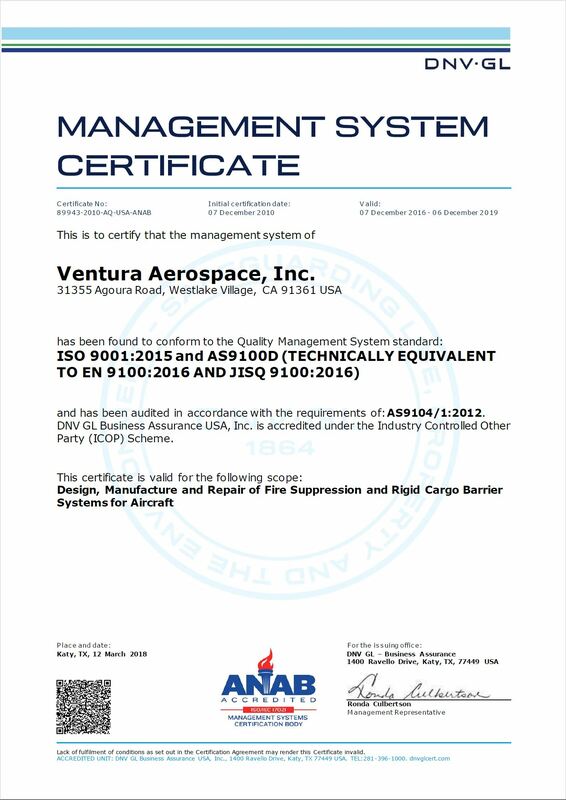 Contact us today to see how Ventura Aerospace can bring increased safety and value to you and your aerospace project.